SCAD works with the poorest of the poor amongst the low caste dalits ("untouchables") and runs a school at a gypsy settlement called Pettai. The school is also attended by children from SCAD's nearby post infectious leper colony as well as the children of snake catchers and other local dalits. The school building was falling into a state of poor repair and becoming a maintenance problem. 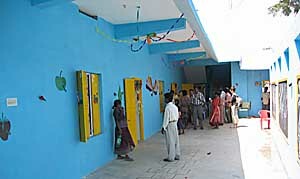 These two projects financed the rebuilding of the main section of the school. 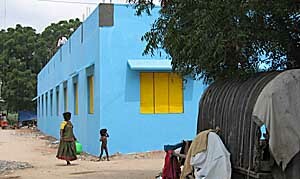 The major construction was completed by local labourers, paid for by the AidCamps, before the first group arrived. 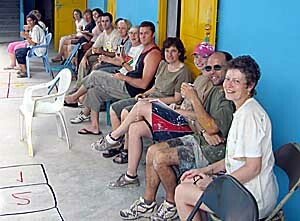 The volunteers plastered, painted, decorated and generally finished the building, with the first group completing the outside and the second group the inside. 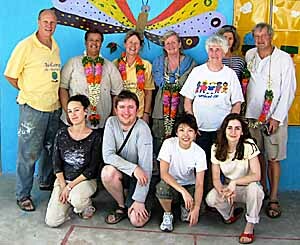 The volunteers were taken on quite a few visits to see SCAD's work for the rural poor in the area, as well as on several local and regional sightseeing trips. "A few words about the project...inspirational, peaceful, relaxed, hot, smelly, bumpy in the bus, sticky with paint, bitten by mosquitoes, sympathetic to those with weakened stomachs, smiling all the time and thoroughly enjoying the whole experience as part of a great team of 20. The project work was good fun and very messy and we were all pleased with 'our' blue and yellow school - the gypsy people 'encouraged' us in our work and made positive noises about all their children attending school in the future! The second storey of the school was being started the day we finished so hopefully another 100 children will begin their 'formal' education fairly soon. Having a bus journey to the project meant that we saw an elephant or two during the trip -- an exciting way to start the day! We also saw local people starting their day's activities; washing in the rivers, themselves, their clothes, their cows, motorbikes and a car or two. We caught sight of parents taking their children to school, one at the front on a motorbike, then the father, then another child or two, then the mother. Where the man with the goat on his bike was going we never did find out! At the SCAD campus itself, where SCAD has just built a school for children with learning difficulties, I had the chance to work with the children, who have had only 6 months at school...they were delightful, well-settled, eager to learn and enjoying the care and commitment and expertise of totally devoted adults. The opening ceremony of this school involved the boiling over of a pot of milk on an open fire in the middle of a brand new floor...a very special memory!!! The look of delight on the faces of the adults and children is another. 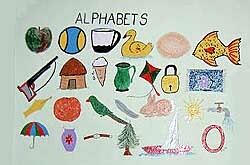 During the second week my husband and I accompanied the head teacher to order educational equipment and resources, they were much needed and will be well used -- 50 children with learning difficulties already being taught and another 50 planned for, and loads of skills and enthusiasm all round from the staff. I managed to play cricket with these and children from SCAD's (yet other) school for children with physical disabilities, and really must practise my spin bowling before my next visit. 'Spin the ball Ita' was the advice offered -- I did try, honestly! I also need to practise my running as one boy with one good leg and one weak leg easily overtook me. 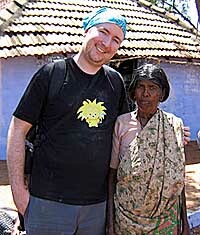 I don't need to practise smiling - all the thoughts and memories of the people of Tamil Nadu make that happen anyway. The effects of the tsunami did have an impact on our stay. The images on videos and camera were of situations only 30 miles away -- many of the college students volunteered to work on a rota system with the SCAD officials who are still involved with the rescue and rehabilitation schemes. 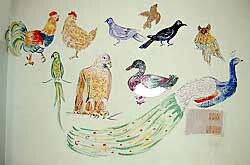 Again the immediate response by SCAD to a great need was unquestioning and total -- and very humbling. The opportunity offered by AidCamps to be part of the SCAD experience even for a short time was very, very special. THANK YOU. I'll be back........."
"AidCamps enables one to experience something of the real India and contribute to a worthwhile cause." "A totally wonderful experience, I feel I haven't stopped smiling since I arrived." "Everything was perfect, a wonderful experience!" "By attending an AidCamp it is possible to see and know the country better than being just a normal tourist." "A wondeful mixed curry of Indian culture and kindness, spirituality, and tolerance - and all with a smile." "Hotter than Kylie Minogue in a sequinned bikini!" 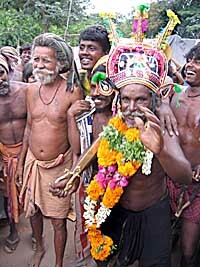 "We have really been given a true taste of India and a huge insight into daily life." "Doing this project gave me a window into an Indian way of life I would otherwise have been completely unaware of." "Better than staying at home!" "Simply fantastic. Worth getting out of bed for." "I hope I will take part in another project, it is very interesting and useful for the population of the country." "A unique opportunity to see rural India and give back something to the people living there." "Eye opening, humbling and inspiring -- and that's just a game of cricket with the local boys!" "Now a serial AidCamper, three times to India, it's great experience." "Left it late for my 'gap year' but such a worthwhile experience." "An experience that will stay with me forever." "What an eye opening experience!" 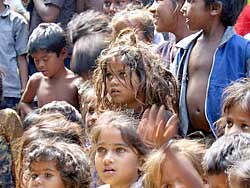 "AidCamps enables one to experience something of the real India and contribute to a worthwhile cause." "A totally wonderful experience, I feel I haven't stopped smiling since I arrived." "Everything was perfect, a wonderful experience!" "By attending an AidCamp it is possible to see and know the country better than being just a normal tourist." "A wondeful mixed curry of Indian culture and kindness, spirituality, and tolerance - and all with a smile." "Hotter than Kylie Minogue in a sequinned bikini!" "We have really been given a true taste of India and a huge insight into daily life." "Doing this project gave me a window into an Indian way of life I would otherwise have been completely unaware of." "Thrilling. Just do it!" "Better than staying at home!" "Simply fantastic. Worth getting out of bed for." "I hope I will take part in another project, it is very interesting and useful for the population of the country." "A unique opportunity to see rural India and give back something to the people living there." "Eye opening, humbling and inspiring -- and that's just a game of cricket with the local boys!" "Now a serial AidCamper, three times to India, it's great experience." "Left it late for my 'gap year' but such a worthwhile experience." "An experience that will stay with me forever." "What an eye opening experience!" "During the two weeks of the Pettai AidCamp, we painted walls, blackboards, murals and window frames, installed new play equipment in the garden, and planted a flowerbed, a green border, and a kitchen garden. Local labourers worked with us, and at several points during the AidCamp I found myself using the universal sign language for 'OK, tighten that nut mate', 'Could you pass that big hammer? ', and 'Ooooh, that'll never go in there'. The locals working alongside us, were great fun, had bags more energy than us wilting flowers in the midday heat, and kept surprising us with their ingenuity. It seems in India anything can be achieved with a length of plastic tubing, a wok, a spanner and a spade. We ended the AidCamp satisfied that we had achieved a lot - the school looked fantastic and the kids seemed to love it. When we weren't at the AidCamp, we saw and experienced some amazing things, and were very well looked after indeed by our hosts. I came to India expecting to lose weight, and ended up gaining it, because we ate so well! Nights were spent sitting on the porch of a small villa, playing cards, reading, and putting the world to rights, with the soundtrack to the night being provided by chattering crickets, and the music that just seems to float on the air at all hours. During the days, chipmunks provided constant entertainment chasing each other, sprinting along the ground with their tales in the air, and stealing flowers from trees, and I swear there must have been twenty dogs with nothing else to do than trot happily along paths and then back again, just for the heck of it. We also had some opportunities in our free time to talk and play with the children on the SCAD school campus; a wide range of ages, some with physical and mental disabilities. The children were reason enough to do the AidCamp alone - they were fantastic fun, friendly, curious and energetic - and there wasn't a shred of self-pity amongst any of them - but there was no pressure to spend our free time doing anything we didn't want. On various trips around Tamil Nadu, I saw some things I will never forget; vast, barren salt pans at Tuticorin; some of the villages affected by the recent tsunami; the friendliest and most curious people I ever met; and genuine rural Indian life. Let me put it this way, we were the only westerners we saw during our time in Tamil Nadu, with the exception of Madurai, and it was common to be waved at, stared at, and being given random handshakes by lift attendants and security guards. The AidCamp has shown me some things I will never forget, given me something genuinely worthwhile to be passionate about, given me the best induction into India I could have hoped for, and allowed to meet a brilliant group of people. I don't know how the rest of India can match up to this." "Third time with AidCamps in India and it just gets better and better!" "It was a privilege to be part of AidCamps." "It was an enjoyable and well run camp and the hospitality was overwhelming." "Just as terrific second time round. It felt like coming home." "Unforgettable experience. Anyone who has a heart to give something back to society should participate." 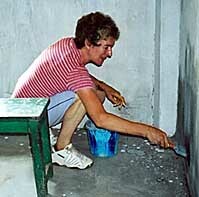 "It was the best introduction to India I could have hoped for, and a terrific project working with brilliant people." "My second visit . . . a wonderful experience and won't be my last!" "An amazing experience which I will never forget." "Third time with AidCamps in India and it just gets better and better!" "It was a privilege to be part of AidCamps." "It was an enjoyable and well run camp and the hospitality was overwhelming." "Just as terrific second time round. It felt like coming home." "Unforgettable experience. Anyone who has a heart to give something back to society should participate." "It was the best introduction to India I could have hoped for, and a terrific project working with brilliant people." "My second visit . . . a wonderful experience and won't be my last!" "An amazing experience which I will never forget."